SAN ANTONIO (Texas) • San Antonio Spurs coach Gregg Popovich bemoaned his team's slow start as the Western Conference heavyweights suffered their first loss of the National Basketball Association season with a 106-91 defeat by Utah Jazz on Tuesday. 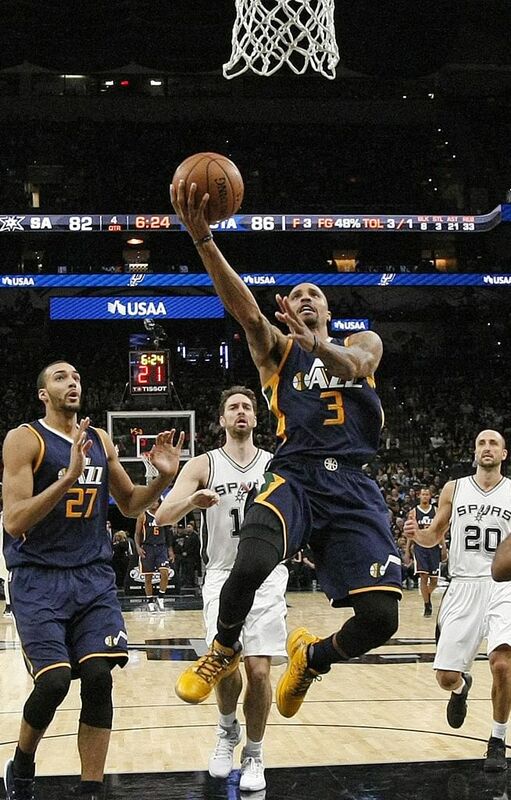 George Hill scored 22 points to lead the Jazz, who improved to 2-2 and snapped a 10-game losing streak at San Antonio, against a powerful Spurs side who had routed Golden State in their season-opener last week. San Antonio forward Kawhi Leonard led all scorers with 30 points to continue his impressive start to the season. But the Spurs were left scrambling after ceding the initiative early on, to the chagrin of the experienced Popovich. "I thought we started out (without much aggression) for whatever reason," he said. "They shot several uncontested shots. I think we followed them around so to speak, just reacted to their offence. "We got back in the game somewhere in the second quarter and the third when we were a bit more aggressive and got into passing lanes. "But every time it was a one or two-point deal we'd miss a shot or they'd make one or turn it over. Overall they outplayed us." Veteran Spanish international Pau Gasol also cited the Spurs' sluggish opening spell as a factor behind the defeat. "We definitely allowed them to play too comfortable and get into a rhythm early on," he said. "It's not normal. They executed well, give them credit. But we didn't put enough pressure on their offence. "They executed better down the stretch, took tough shots and we didn't. Once we were down we stepped it up, but you've got to start from the get go." Utah built a 16-point lead in the first half, which San Antonio cut to four (54-50) by the intermission. San Antonio took a three-point advantage (63-60) on a Tony Parker layup at the 5:48 mark of the third quarter, but the Jazz quickly made up the ground and the Spurs never led again. Over the last five minutes of the game, Hill poured in eight of the Jazz's final 15 points. "You probably can't value it enough, just having a guy who when he has the ball kind of calms everybody," Jazz coach Quin Snyder said of Hill, a 30-year-old guard. "He knows what to say and what to do. I know for me it's terrific to have somebody you can communicate with on the floor and who can relay (the message)." Had San Antonio won, it would have marked the first time Popovich started a season 5-0 with the Spurs, noted ESPN. "As you know, George Hill just got away from all of us," Leonard said. "It's not one man's job (to stop him). It's the whole team's. "Every loss is disappointing to me. It's just disappointing that our defensive effort and energy wasn't there in that first quarter. "They were knocking down shots in the fourth quarter, as well. I think they scored 33 points in the fourth quarter and that's not good, either."